Vodafone is the number one UK-based brand, with success driven by a strong purpose, according to new research. 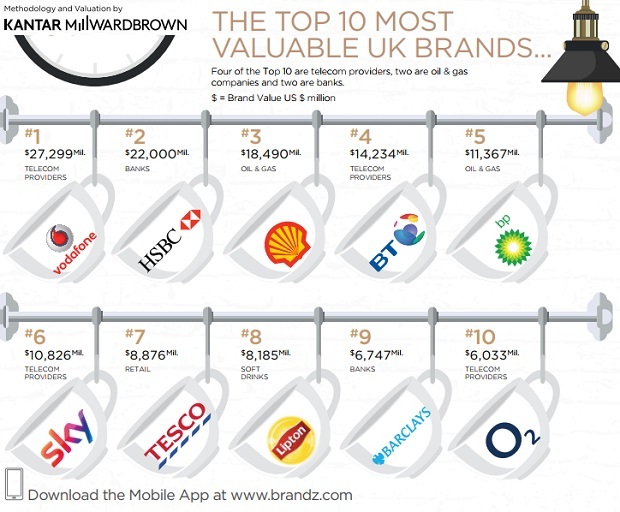 The first annual ranking of the BrandZ Top 50 Most Valuable UK Brands has been announced today by WPP and Kantar Millward Brown. The study highlights ‘innovation gap’ that provides growth opportunities for UK corporations and disruptive start-ups. The list includes some of the most famous brands in the world, and reflects the UK’s role as a centre for financial services, energy exploration and communications. Many of these brands are incredibly strong and enduring. They are also successfully keeping step with consumers’ changing attitudes and priorities as the UK prepares to leave the EU – providing value for money by demonstrating quality and longevity, and telling stories that resonate with people’s lives. Services and infrastructure brands make up half of the Top 50. These brands, from the well-established telecoms, finance and utilities industries, hold eight of the Top 10 places and contribute 66% of the total value of the Top 50. The BrandZ research reveals that the UK’s leading brands are well-known and highly regarded both at home and overseas. However, consumers do not perceive them as particularly innovative, which puts them at risk from smaller, newer rivals. Innovation plays an important part in value growth: the UK brands that consumers score highest on innovation are almost twice as valuable as those with low scores. The combined value of the brands in the ranking is US $234.5 billion; equivalent to £173.7 billion. Vodafone is no.1 with a value of $27.3bn, accounting for 12% of the ranking’s total value. It has a strong company purpose – to connect everybody to live a better today and build a better tomorrow. This is expressed through a new positioning, ‘The future is exciting, Ready?’, and inviting people to benefit from new and exciting technologies. Countering a general lack of love for its sector HSBC (no.2) has invested in internal change programmes and service innovations to make customers’ lives easier. These are starting to be reflected in improved customer perceptions, reputation, and brand value. Exporting is vitally important for ‘Brand Britain’. The Top 50 earn 54% of their revenues outside the UK; for the Top 10 the figure is higher at 63%. The exporters that generate most revenues overseas include ASOS, Dyson, Lipton and Vodafone. Brands that are clear on what they stand for, are innovative, and know how to deliver a great brand experience are better positioned to cross geographical borders and appeal to consumers across the globe. • The UK’s leading brands lag their global peers on five measures that lead to long-term financial growth. They score only slightly higher than average across the five – purpose, innovation, communications, brand experience and love – with Dulux, Boots, BBC, Tesco and BA amongst the highest scoring. Over a decade, the UK Top 10 have grown less than a third as fast as the Global Top 10 (66% vs 249%). They’re seen as less innovative than they were in 2006, and are less loved. • There are 11 banking and insurance brands in the Top 50, contributing 21% of the total value. • The nine entertainment and telecoms brands account for almost a third of the value of the Top 50. • Retail also features strongly: the nine brands contribute $25bn to the Top 50’s total value. Tesco (no.7) has improved its performance in the market by refocusing on customers’ needs, successfully improving the experience and service it delivers. • Trust is about more than being deeply established. The most trusted UK brands – which include BA, Cadbury, the BBC and Royal Mail – are more likely to be loved and recommended by consumers. However relative newcomer MoneySuperMarket, which is not currently in the Top 50, is 22% more trusted than the average brand, showing that newer brands can gain trust too. 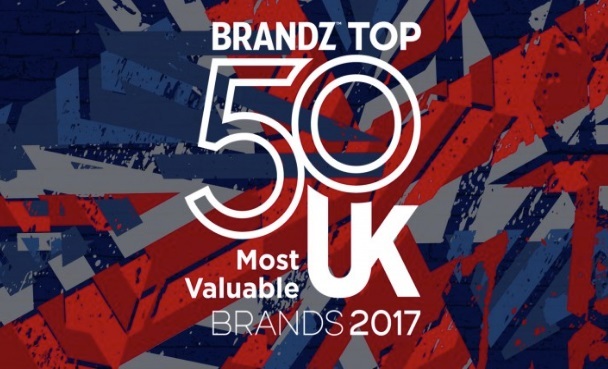 The BrandZ UK Top 50 study ranks the UK’s most valuable brands, analyses their strengths, and identifies the key forces driving growth in this market. It is the first edition of an annual report that will track and anticipate the evolving environment for brands in the UK, and chart their changing fortunes. The ability of any brand to power business growth relies on how it is perceived by customers. As the only brand valuation ranking grounded in consumer opinion, BrandZ’s analysis enables UK brands to identify whether they are seen as innovative, and provides clear strategic guidance on how to boost innovation for the long-term and, importantly, use communications to ensure that innovation is recognised as such by consumers. Businesses worldwide trust BrandZ to provide the information they need to measure, manage and protect their most important intangible asset: their brand. The BrandZ UK Top 50 report incorporates new research from Y&R’s BAV Group, which examines what it takes to build powerful nation brands. According to BAV Group’s 2017 Best Countries report, the UK ranks third best overall out of 80 countries, and scores particularly highly on education, entrepreneurship, power, strong international alliances, and economic as well as cultural influence. How people view the UK is also a strong reflection of how they may view the country’s brands, and the UK’s reputation as a world leader bears significant weight on the global power of its brands. 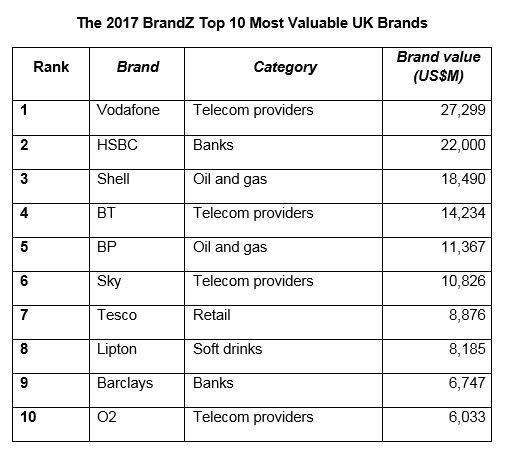 The BrandZ Top 50 Most Valuable UK Brands report and ranking, as well as other brand insights for key regions of the world and 12 market sectors, are available online here.